You’re innocent until proven guilty, but don’t expect any special treatment for you or your knives. The following in an excerpt from Knife Laws of the U.S., a must-have book published by BLADE available at ShopBlade.com. You have NO need to read this article because it could never happen to you. Right? This article must have been written for knife-wielding thugs or street gang members. Right? Why would law enforcement authorities ever come after you? Right? The Fifth Amendment protection against self-incrimination, also known as the “Right to Remain Silent,” is one of the most important Constitutional protections Americans have, that many other countries do not grant. Yet, naive people in the United States routinely ignore Fifth Amendment protections and bury themselves with “explanations.” When it comes to a criminal violation, most law-abiding citizens are ignorant about the details of the law and its many loopholes and defenses. By opening their mouths, they remove all doubt about their ignorance and usually give the state something not just to use against them, but to twist against them. The Sixth Amendment guarantees an individual’s right to an attorney. By asking for your/an attorney and remaining silent, honest knife owners provide themselves with a fundamental foundation for a strong legal defense. Defense attorneys smile when they learn their clients stood firm on their rights. Say, “I want my attorney.” If you do not already have an attorney, say, “I want an attorney.” Requesting an attorney does much more than simply getting legal counsel. Simply requesting an attorney causes a wall of Constitutional protection to spring up around you. A right given up is a right lost. Do not consent to a search without a warrant. Do not sign any documents or statements without an attorney’s advice. All citizens have a Fourth Amendment right to a warrant being issued before their person or premises are searched. There are exceptions to the necessity for a warrant, and there is a large body of law that exists as to when law enforcement officers have justification or probable cause for a warrantless search. However, whether an exception for the warrantless search exists or not, you should never consent to a warrantless search. 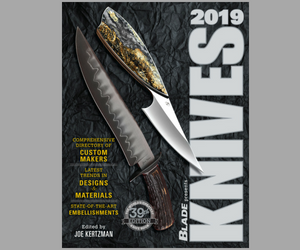 BLADE strongly recommends every knife enthusiast, especially those who work with knives as part of a trade, keep a copy of Knife Laws of the U.S. nearby. This isn’t just a book of laws. It offers expert analysis from Evan Nappen, the country’s leading attorney on knife laws, to keep you and your knives on the right side of the bars. The book is available at ShopBlade.com at a terrific price, but the information is priceless. Evan F. Nappen, Esq., is one of the most respected legal authorities in the nation on the topic of knife law. As an attorney, Nappen has fought nationally for knife rights and has successfully defended honest citizens charged with knife crimes. He has authored an extensive list of books and magazine articles, and has appeared on CNN, Fox News, NPR and many other news outlets. He lives and practices law in Eatontown, New Jersey.